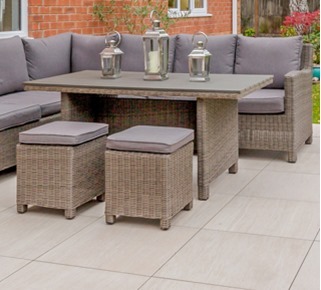 This couple from Bristol contacted PrimaPorcelain in hope that we could help bring new life to their tired and outdated outdoor living space. The couple previously had a traditional wood deck alongside a veranda with a polycarbonate roof, but they were looking to upgrade to a more stylish, contemporary-looking space. After conducting some initial research online, the couple came across PrimaPorcelain and were instantly drawn to our range of products. They visited our showroom, and before long, work was underway on their new outdoor living space. This project was completed by our professional installation team using a combination of products - including our gorgeous 20mm Tirolo Cream porcelain paving slabs, which perfectly complement their new, modern veranda. "The installers were very good, worked solidly, asked us our opinion on anything that had options, and kept us well informed. "The finished space is exactly how we imagined it - we love it and have been recommending PrimaPorcelain to other people that we know." Greensquares, our parent company, also supplied a stylish garden veranda for this project. This structure provides shelter for the new seating area, our 20mm Tirolo Cream pavers make the perfect veranda tiles! If you'd like to find out more about the verandas and garden rooms that Greensquares can supply, please contact us today. Both the customer and the team here at PrimaPorcelain were delighted with the final look of this paved veranda. The couple's upgraded outdoor space looks beautiful, and we hope that it will bring them many years of enjoyment! 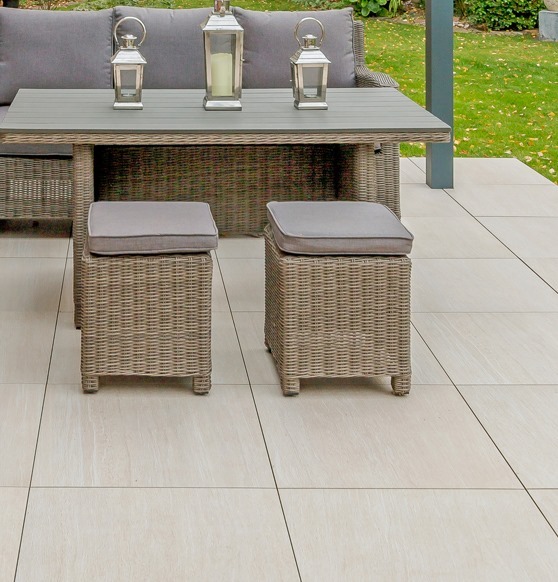 Due to their state-of-the-art manufacture, our Tirolo Cream paving slabs will look as good as the day they were installed for years to come, requiring practically zero maintenance. 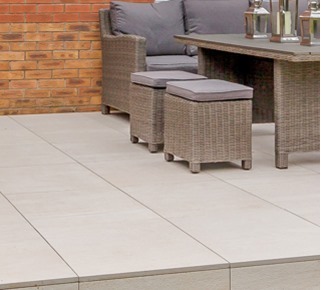 If you’re looking to re-design your garden or create a new outdoor living space with gorgeous, low-maintenance porcelain tiles, do not hesitate to contact us today. 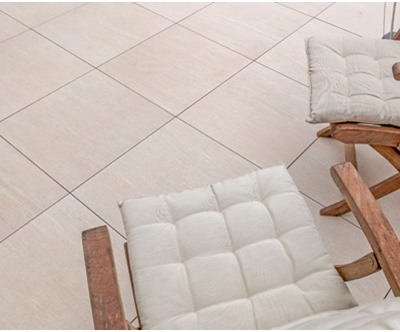 Don't forget to order your FREE porcelain paving samples!